Wondering How To Properly Feed Wire on BNT-40 Rebar Tier? Read This! This post will illustrate the proper way to replace and feed a new spool of wire into the BNT-40 Rebar Tier. Don’t feel like reading? Watch the video at the bottom of this page! 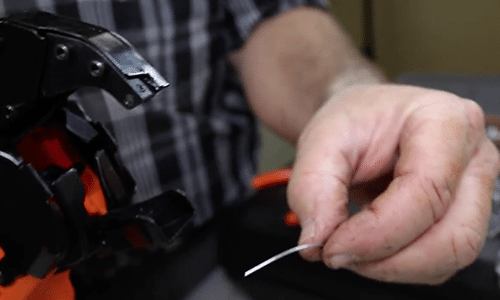 Clip off the end of the new spool to ensure it is straight and burr-free. Then, set the spool inside the housing and close the door. Press this latch, which will open up the gears. Then, open the see-through lid. Feed the wire until you feel resistance. Do not attempt to continue feeding. As soon as you feel the wire stop, slowly pull it back about a half-an-inch. 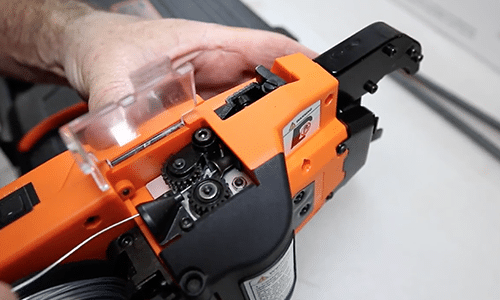 By not pulling the wire back a half-inch, you run the risk of the cutter leaving small fragments of wire in this area, which will likely cause the machine to jam up. 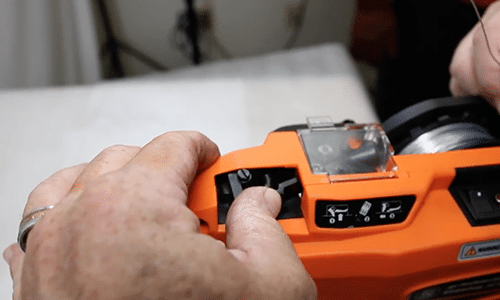 If you need to know how to clear a jam from a BNT-40, click here to watch that video. Engage the gears once again, turn on the tool, and pull the trigger to cycle the unit. A piece about one and a half inches long should be ejected, and now you’re ready to use the BNT-40. Each time you use the BNT-40, it’s a good idea to get in a habit of lifting the unit up after each tie, just like this. This dial determines the tightness of the tie. 5 is the tightest, also the slowest speed, and 1 is the fastest, which is also the loosest tie. To save power, the unit has a built-in shut-off feature. It’s possible that the user will go to pull the trigger and nothing will happen. Simply flip the on/off switch and the unit will reset. 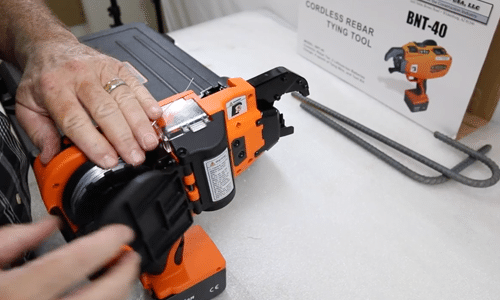 We hope this overview of how to properly feed wire on BNT-40 Rebar Tier was helpful. If you have any additional questions, call 800-992-3833.